William Campbell was an important leader of the Revolution on Virginia's frontier. Campbell was among the first group of people to declare their willingness for a violent revolution if that is what it took to maintain their rights. He went on to play a large role in the Battle of Kings Mountain, an American victory which boosted moral enough to win the War in the South. William Campbell was a successful farmer on the Virginian frontier. As with all able-bodied men in the area, Campbell served in the local militia. In 1774, William served in Lord Dunmore's War. This war was fought between the people of Virginia and the Shawnee and Mingo Native American nations in what is now West Virginia. The Virginians claimed they were being attacked on neutral land in violation of recent treaties. After this brief war ended, Campbell returned home to discover the First Continental Congress was already in session in Philadelphia. As one of the most prominent men in the region, Campbell met with other frontier leaders regarding the troubles with Great Britain. The Fincastle Resolutions were sent to the Virginia delegates in Congress. Campbell's signature certainly added weight to the letter because his brother in law was one of the recipients in Philadelphia: Patrick Henry. Campbell was named a General of the Hanover County militia, which he led during the Revolutionary War. Much of their fighting was in the west, with forays into the Southern Department. In the autumn of 1780, word reached William that he was needed to support two North Carolina militia leaders who were under attack. Campbell, in turn, sent out word that help was necessary. Due to his help, the Patriots were able to muster approximately the same number of men as the Redcoats had. The enemy, however, was not 'the British' in the way we might usually think of them. Instead, this group was another American militia. A Loyalist militia. What ensued was the largest all-American battle that would take place until the Civil War. This fight would afterward be known as the Battle of Kings Mountain. The Loyalist leader, Patrick Ferguson, witnessed how the Patriot numbers had swelled and decided to retreat to the safety of the main British Army. The Revolutionaries won the Battle of Kings Mountain. This was significant because, after a series of hard losses in the Southern Department, moral was low. Campbell's victory gave hope to the Patriot Cause. William Campbell also received election to the Virginia House of Delegates around this time. Due to his heroics at Kings Mountain, Campbell was promoted to Brigadier General in the Virginia Militia. Unfortunately, he passed away (probably from a heart attack) just a few months later and was unable to see his homeland win the Revolutionary War. William Campbell does not have a modern biography that I am aware of and, therefore I am today recommending 'Dunmore's War.' 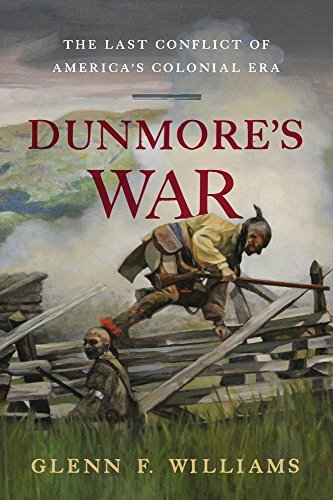 It is an interesting look at a small war which soon-to-be revolutionaries fought in the name of their Governor (literally, Lord Dunmore was the last Royal Governor of Virginia). It outlines many of the concerns had by Campbell and his community on the frontier. Purchase through the link below and support this site at no additional cost to you on Amazon. Don't forget to subscribe to our email list if you haven't yet, you'll get an article every day!